[W]hen oil prices fall, fuel efficient cars, homes in city-centers, and public transit investments all drop in value. This can lead to economic waste: underused automobiles, unrented homes, empty subways. A particularly glaring example came on Wednesday when President Obama visited a Ford plant that makes fuel-efficient vehicles: because of the drop in oil prices, that plant was closed, wasting both the factory and the skills of the workers that it would have employed. In this world, a newly higher gasoline tax would actually avoid economic waste rather than creating it. Ford and others that invested money on the expectation that oil prices would remain relatively high (and, if options prices on oil futures as recently as six months ago are any indication, that means most businesses) would see their investments hold more value. The same goes for drivers who, facing higher oil prices, already spent their money on ever-more-fuel-efficient cars. (They’d still pay more at the pump, but the resale value of their cars would rise.) One can go down the list of oil-sensitive consumers and find more examples like this. The federal levy—which amounted to about $23.5 billion in gasoline tax revenue in the 12 months through September 2013—has stood at 18.4 cents a gallon since the first year of the Clinton administration, despite multiple proposals over the years to raise it. Over the past decade, Congress has approved higher spending for highway construction but hasn’t raised the tax to pay for it, creating periodic funding crises. Gas tax supporters say that it is time to raise the tax because it has not been raised in two decades. 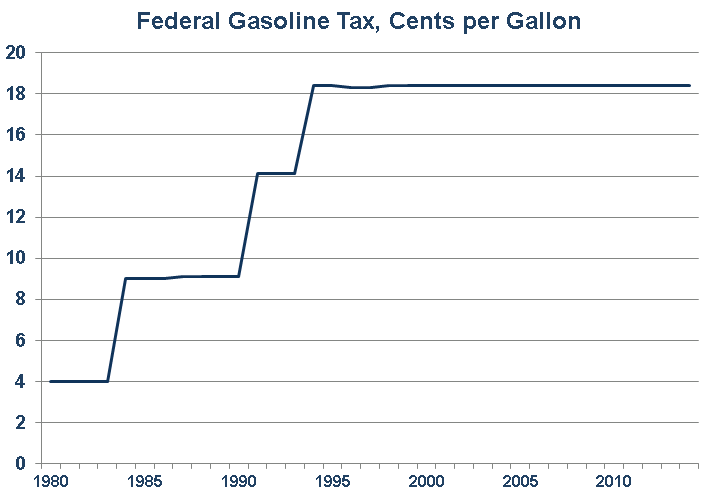 What they leave out of the story is that the gas tax rate more than quadrupled between 1982 and 1994 from 4 cents per gallon to 18.4 cents, as shown in the chart [above]. Thus, looking at the whole period since 1982, federal gas tax revenues have risen at a robust annual average rate of 6.1 percent (based on Tax Foundation data). So, again, we have a spending crisis, not a funding crisis. Next Next post: How Will History Judge Obama?